While I managed to capture a few photos of our commute through the old growth forest, I didn’t capture much of the work we did over the next week. The phone/camera was tucked safely I’m a waterproof bag inside my pack most of the time. The reason for that is that during our commute, we had to cross a stream that was knee-deep in spots with sketchy footing. By afternoon the flow would become quite strong as the snow above melted. That was our first goal, to fix the water crossing so that pack animals could cross. 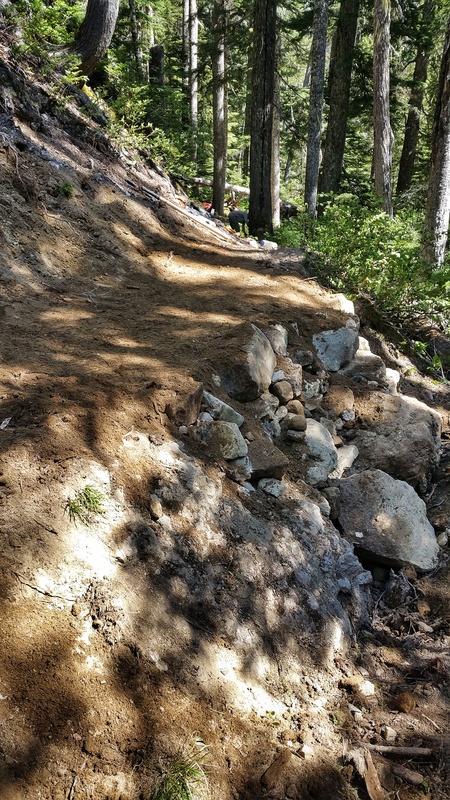 After several hours of moving rocks to lessen the pressure on the trail and filling the washed out tread with new rocks, we had to call the job. The water was rising rapidly, we could no longer see the holes we needed to fill, and we had reached our technological and physical limits on rock moving. So we moved up trail to cut trees. 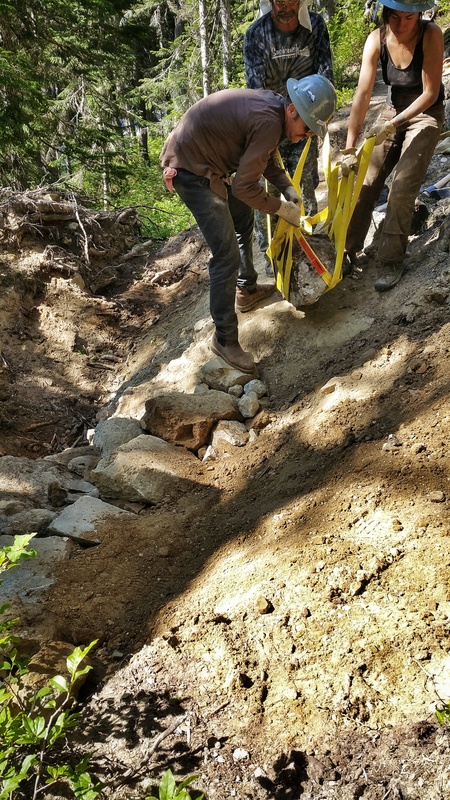 That was the bulk of the next week, with multiple saw teams leap-frogging each other to clear trees that had fallen across the trail. While I don’t have any pictures of that work, there are plenty of examples elsewhere in this blog. The big difference between its week and any other is that as a certified crosscut sawyer, I was now responsible to lead my crew and ensure their safety in some decidedly unsafe situation. Our last day of work shifted our priorities. 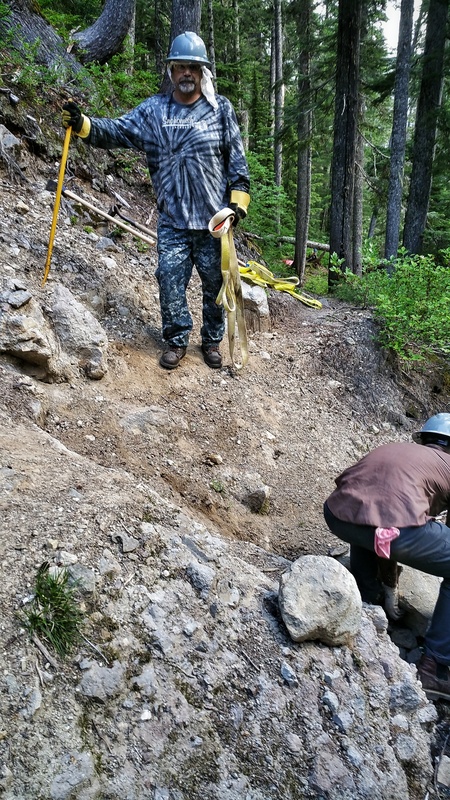 We had moved camps, now some 12 miles from the trailhead, working deeper in the Wilderness than a crew had for a dozen years or so since the access road had been washed out. I now understood why the trail was in such horrible shape through that section, a section that heard plenty of cursing from both Goddess and I. Our work this week was to prepare the trail for the next two crews who were due to follow each other overy the next couple of weeks and push deeper into the wilderness, aiming to clear and restore another 10 miles or so of tread. Buy before that, they had to be able to get past our “spike” camp and a washed out section of tread. 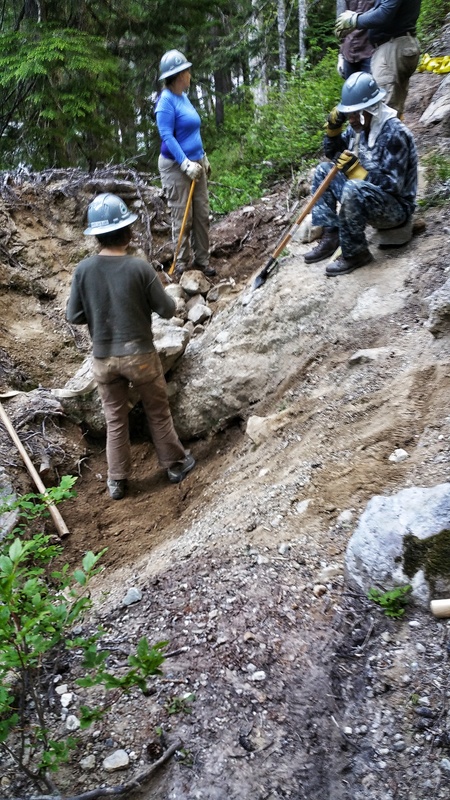 The only way to make it safe for hikers and horses alike was to fill the gap with rocks. Before, looking northbound along the trail. There is one small gravel covered rock to step on. Guess wrong on the gravel and it hurts. Our pack trains would not be able to pass this spot. Oh, and everyone say “hi” to Jerry. The opposing view, now looking southbound on the trail. That gives you a better idea on the depth of the hole. Fixing it took quite a bit more work than just simply throwing rocks in. Each piece had to be placed so that it interlocked with its surroundings. The bigger the better. Jerry is sitting on the level of the tread that we need to build to. It took rocks like this, which turned out to be a three-person carry. To build the foundation properly, we needed more than a few of these. Also, you can see the one flat rock to the right, spotlit by the sun, that was the only reasonable step to get across this feature. A few hours later, this is what we came up with. Viewpoint is the same as the first picture, looking northbound. All in all, a pretty rewarding little project to finish out the week before hiking back to main camp to spend the night before hiking out to the trailhead the next day. A perfect time to get some rest and get ready for the next gig.